Stanford baseball’s pitching staff was bailed out by its offense for a change, as the Cardinal scored 10 runs — their most in a 20-game span dating back to March 4 — to defeat Santa Clara (17-23, 8-7 WCC) 10-9 on Tuesday night. The Cardinal (16-17, 6-9 Pac-12), in their fifth consecutive one-run game, sent out six pitchers after freshman starter Tyler Thorne got the hook after allowing four runs over 1.1 innings. With four games over the next six days, having the bullpen work a season-high 7.2 innings couldn’t have been what Marquess had in mind to start the week. It was a sloppy game pitching-wise for both teams, as they combined to surrender 13 walks, seven hit batsmen and 13 wild pitches. 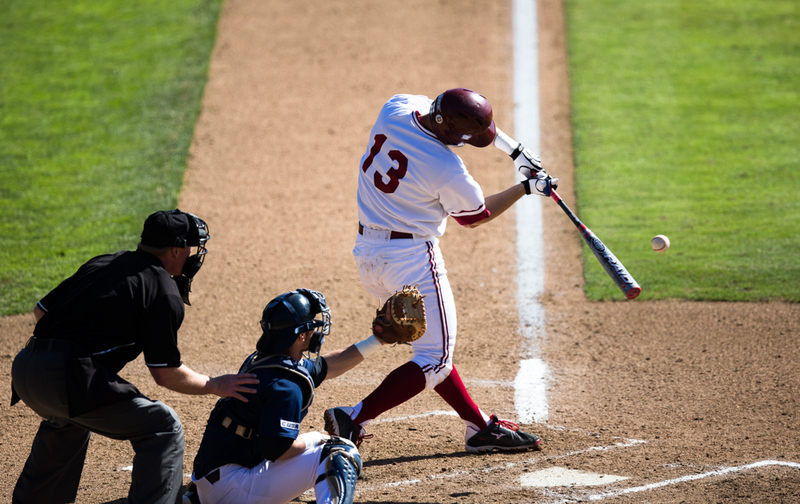 Stanford’s staff accounted for nine of those walks, two hit batsmen and seven wild pitches. Yet freshman Jack Klein led a strong Stanford offense, picking up his first career hit and going 3-for-3 with two walks and three runs scored. Junior Austin Slater went 2-for-5 with a triple and two RBIs and senior Alex Blandino went 2-for-5 with an RBI and three runs scored. Santa Clara got off to a quick 3-0 lead after freshman Stevie Berman homered with runners on the corners and one out in the first inning. But the Cardinal bats responded quickly, scoring six runs — the most they’ve scored in an inning since the third game of the season on Feb. 16 against Rice — on four hits and an error in the top of the second. They sent 10 hitters to the plate and were propelled by an RBI double off the bat of Blandino and an RBI single from Slater. Thorne was chased from the game in the bottom half of the inning after allowing back-to-back singles, though his replacement, sophomore Logan James, wasn’t very effective either. James lasted just 1.2 innings and allowed three runs on a hit and three walks, with all of those runs coming in the bottom of the fourth as the Broncos knotted the game at seven. Stanford regained a one-run lead in the fifth thanks to an RBI double from senior Brett Michael Doran, who went 2-for-5 in the game. And in the sixth, the advantage was stretched to three runs after Blandino crossed the plate on a wild pitch and sophomore Drew Jackson doubled in Klein with two outs. The Broncos would cut their deficit to just one run after scoring once in the sixth and once in the seventh off two freshmen each named Chris — Viall and Castellanos. They threatened to tie the game in the eighth after sophomore T.J. Braff doubled off Castellanos with one out. However, senior A.J. Vanegas got the call for the multiple-inning save and was able to convert the opportunity for his fifth save of the season. The Alameda, Calif. native continued his 2014 dominance, getting the next hitter to fly out and then striking out the hitter after that to finish off the eighth. And in the ninth, Vanegas retired the side after hitting the leadoff man. His 1.2 shutout innings on Tuesday raised his season total to 20 innings, over which he has yet to allow an earned run. The Cardinal face a quick turnaround, as they will take a drive to Moraga, Calif. for a 3 p.m. matchup against St. Mary’s this afternoon. Today’s game is a make-up after the original March 25 contest was rained out. It will be the second Stanford-St. Mary’s matchup in two weeks, as the Gaels visited Sunken Diamond last Tuesday in a game replete with drama. St. Mary’s sent sophomore Jake Valdez to the mound in the ninth inning, nursing a narrow 6-5 lead. After allowing a leadoff walk to Blandino, Valdez retired the next two Cardinal hitters — one out away from securing a Gaels victory. Yet two pitches later, sophomore Zach Hoffpauir smacked a game-tying triple to right center, paving the way for senior Danny Diekroeger to deliver a walk-off single just minutes later. St. Mary’s enters today’s matchup on a season-long 13-game losing streak, having just dropped a 3-1 contest to UC-Davis on Tuesday afternoon. Its hitting has faltered of late, as the team’s season batting average has dropped to .257 over the skid — Stanford’s pitching staff held the Gaels to just four hits in last Tuesday’s matchup. Stanford will send out freshman Brett Hanewich to start the contest, who hopes to rebound from a short outing last Thursday against Arizona State. Hanewich lasted a season-worst 3.2 innings, allowing three runs on six hits. Over his last four starts, he’s gone 1-2 with a 6.64 ERA, as opposed to a 0-1 record with a 1.46 ERA over his first five starts of the season. The Cardinal, winners of five of their last six games, will look to retain their momentum at Louis Guisto Stadium at 3 p.m. today.